The perfect harmony of two precious metals - platinum, palladium, gold or silver - give a special monogram added elegance. This beautiful rectangular pendant features a choice of three lettering styles. An optional gem, heart, flower or other decorative symbol can be added if you wish. 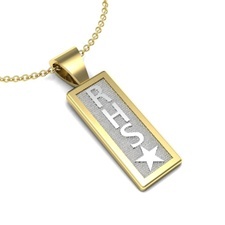 Pendants are available in a Platinum, Palladium, 18k, 14k, and 10k Yellow & White Gold. Price quoted below is for 14k Gold. Spacer & Gem Options: Spacers and gems are optional. If a spacer or gem is chosen, it will be placed as the last character in your personalization. Spacer choices are heart, star, cross, Star of David, flower. View spacer options.View birthstone selection.